Glowing candles that look as though they have been wrapped in gift paper make a stunning presentation on this birthday card. Set against a black background with white lettering, the colorful candles are fun and eye-catching. 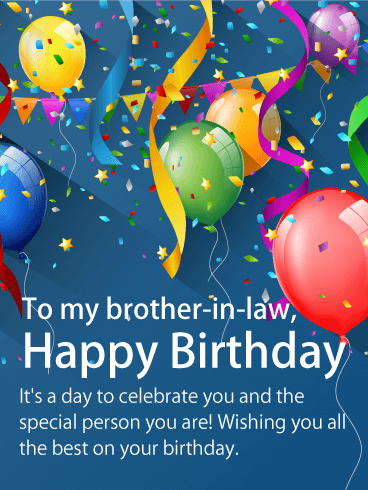 Select this happy birthday card if you would like to send your brother-in-law a simple but genuine message of good wishes on his birthday. You can't go wrong with this bright and colorful happy birthday card! Your brother-in-law's birthday is a big deal. Let him know with this festive fireworks-themed card! Bursts of blue and orange in the background set the scene for an unforgettable celebration. And the words will inspire him in the year ahead. So if you want to make sure his day is a total blast, this is the greeting to get it done! Big celebrations were meant to be celebrated in spectacular style. 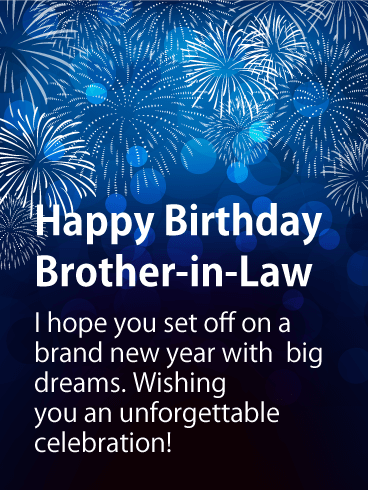 And this birthday card is the perfect way to do it for a brother-in-law who means the world to you. Bright blue fireworks in the background add excitement as your sentiments are boldly exclaimed in front. It's a chance to wish him an unforgettable day and a year ahead that's filled with big dreams. 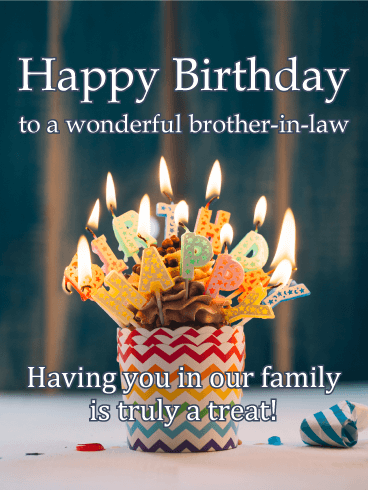 A brightly lit cake, festive balloons, confetti and a nicely wrapped gift all go into making this birthday card for your brother-in-law the very best one he'll receive! It's a chance to remind him that it's a day for celebrating, and that he should enjoy it by doing whatever it is he loves most. What a great way to put him in the mood for a party! 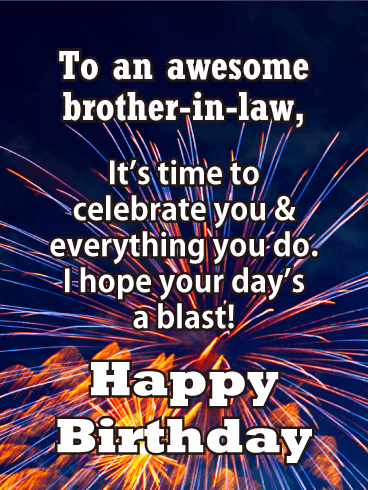 If you've got a great brother-in-law in your life, this birthday card will let him know! A delicious, candle-topped cupcake wishes him an awesome year ahead, while reminding him how much he brightens your family with everything he does. Simple yet sweet, this festive greeting is sure to have him smiling on his big day. You think the world of your brother-in-law, which is why this birthday card is such a special way to let him know. A handsomely wrapped gift with a blue bow brings the element of excitement to his celebration, while a bold, lighted background adds to the festive feeling. And the touching words will remind him how much he is appreciated and loved. This thoughtful birthday card will brighten the day of a special brother-in-law on his birthday. A cup of coffee sits next to a nicely wrapped gift, the perfect way to start his day as he celebrates another year and looks forward to all the wishes headed his way. Whether you're there with him, or sending your love from miles away, this greeting is just as memorable as any gift he'll receive. 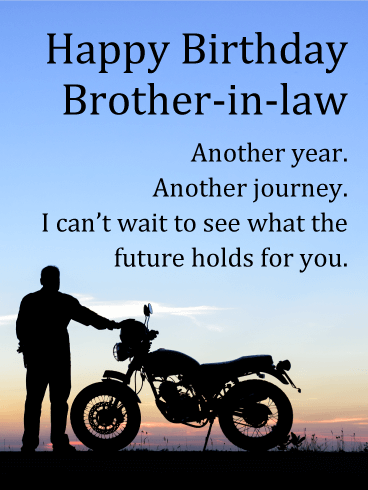 It's your brother-in-law's birthday and this cool card is the perfect way to wish him well as he looks forward to another year and another journey. Standing next to his motorcycle, this riding enthusiast takes a moment to reflect before his next adventure just like your brother-in-law can look back on how far he's come while also looking ahead to the future, knowing there are lots of miles still to be traveled. A sunny day at the beach. A full tank of gas. A sports car that's revved up and ready to go. It's the perfect way to help celebrate someone very special like your brother-in-law on his birthday! 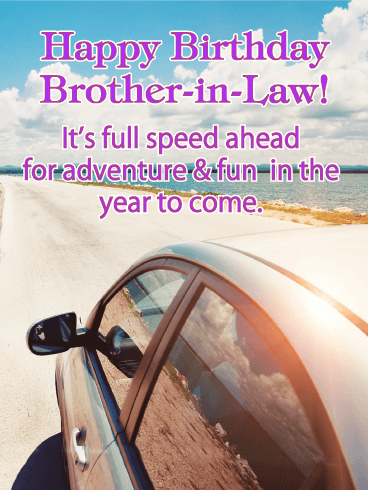 This birthday card will remind him that it's full speed ahead for a year full of adventure and fun, and this is just the start of the many great times to come! 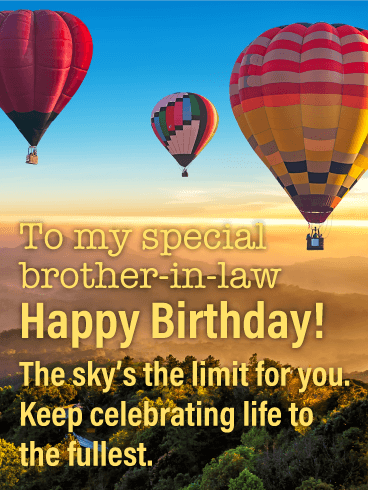 It's high-flying birthday fun for your brother-in-law when you send this birthday card! What a wonderful and inspiring way to remind him that the sky's the limit when it comes to everything he can accomplish in the year ahead and this celebration is just the beginning of all the wonderful adventures to come. A rustic wood background gets a festive touch from balloons and confetti, bringing lots of colorful fun to your brother-in-law's birthday! What better way to help him celebrate this special day while reminding him just how incredibly awesome he is. It's these words that will stick with him all through next year, knowing you took the time to let him know how you feel. Beep beep! Coming through, clear a path, move aside! We've got a special man's birthday to celebrate over here! 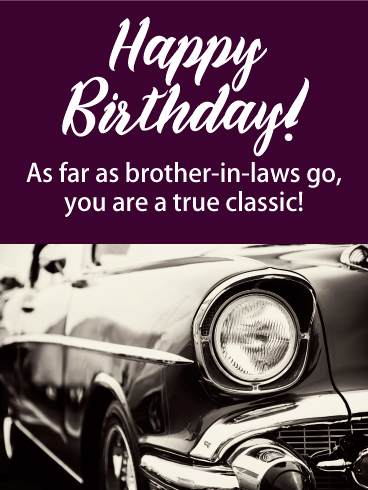 Your brother-in-law is one cool dude so send him the Classic Car happy birthday card - he's sure to appreciate how tasteful it is! With sleek lines, deep blues, and a powerful compliment, this card can't fail to make his day even brighter! What gets better with age? Wine, collector vehicles, and your amazing brother-in-law! 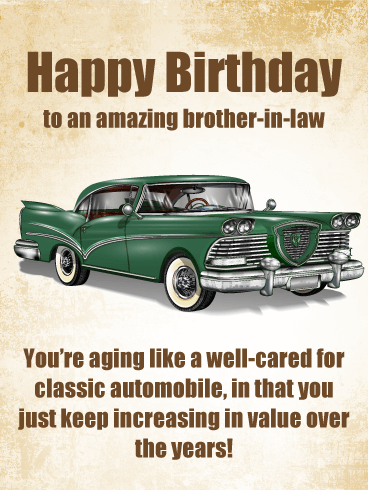 Send him some seriously classy love this birthday with the vintage automobile card! Guaranteed to make his heart go "vroom! Vroom!" and bring a big smile to his face! They say getting older isn't for the faint of heart, so this birthday card will reassure him that he is strong and timeless! You all really hit the jackpot when this amazing guy joined the extended family! Time to bust out the good, sippin' Scotch, pour a glass, and raise a toast for your best brother-in-law! It's his birthday and he's worthy of high praise and grand celebration! Show him you know how incredible he is by sending him this clinking glasses happy birthday card! You know that feeling when you're so happy it's like you're floating in the air? That's the theme for this birthday card for your brother-in-law! It is adorned with vibrant balloons and balls, multicolored banners strung with care, and all set over a cheery sky like blue background. Because your brother-in-law has earned a day full of relaxation, and fun, with a family that's as good to him, as he is to the world. What better excuse to TREAT YOURSELF, than on your birthday!? That wild, witty, wonderful brother-in-law has been a pleasure and delight ever since he joined the family. These lit Happy Birthday Candles in a celebratory chevron party cup, convey a sense of festivity and warmth. However the real treat will be knowing how welcomed and loved he is when he receives this heartfelt card. This charming and sweet cupcake card could have taken its inspiration from your brother-in-law. On his birthday tell him he is incredible and that you are grateful to have him around. The golden banner wishing him a happy one, drapes festively before a chocolate caramel cupcake, topped with a glitz and glittery candle, over a purple starburst background. What better way to encourage your brother from another mother to enjoy their day? Your family has always been on top of their events, get-togethers, and celebrations! You were already well-established legends of throwing the best neighborhood block parties, and yet when your brother-in-law joined the family he added even more spirit and life to the mix! Wish that superstar a happy birthday with this party banners card! This birthday card can't fail to have him feeling the love! Who doesn't love a fresh twist on the old classic "roses are red, violets are blue" poem? 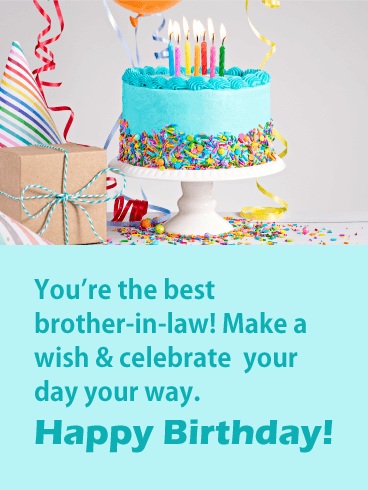 Send this happy birthday card to your favorite brother-in-law to make him feel loved on his big day! The celebratory poem birthday card says you like him so much you’d even willingly part with a wish if it meant you could give it to him! Is your brother-in-law the type that is always going above and beyond to help out the family? Whether it’s moving heavy furniture, running errands, or making his signature potato salad for the picnic- you can always rely on him! Let him know how much you appreciate his efforts to be a team player by sending him this present pile happy birthday card! Hot dog! It's your beloved brother-in-law's birthday and you’re so excited you may cough up a hairball! Just kidding! Send your fun-loving bro this smiling puppy and goofy grinned kitty birthday card to make him bark with laughter on his special day! Complete with party hats and sweet confections, this card doesn't miss a beat in wishing him the best day ever! 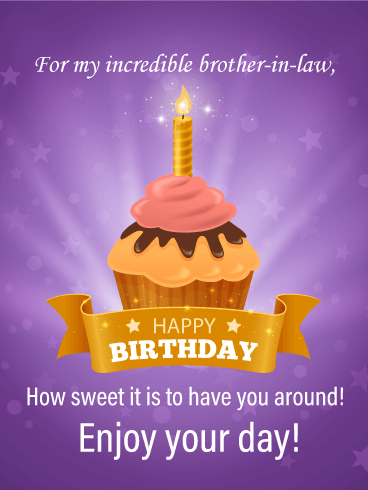 Send warm wishes to your brother-in-law with this attractive happy birthday card. With tangerine lettering and blue balloons of different shades, this brother-in-law birthday card is striking and colorful. Your brother-in-law will appreciate your special thoughts when he receives this happy birthday card. 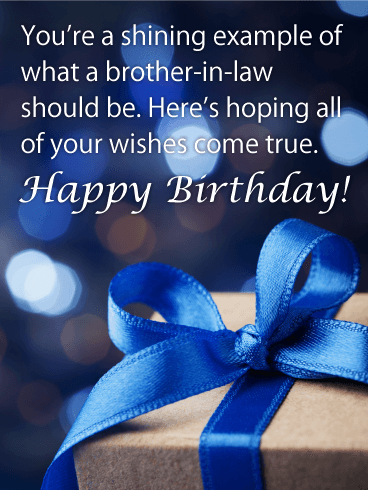 Make a thoughtful choice and remember your brother-in-law on his birthday with this outstanding happy birthday card. 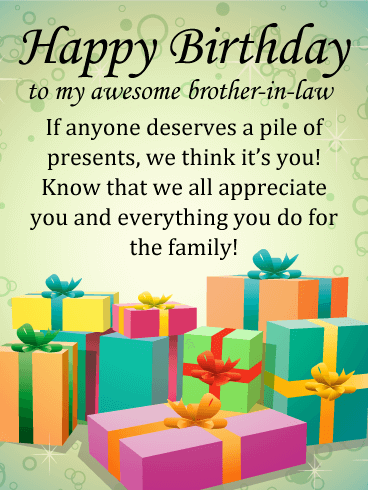 This festive happy birthday card sends the perfect note of appreciation to your brother-in-law on his special day. Wish him a day full of celebration, and let him know he is special to you and your family with this bright happy birthday card. 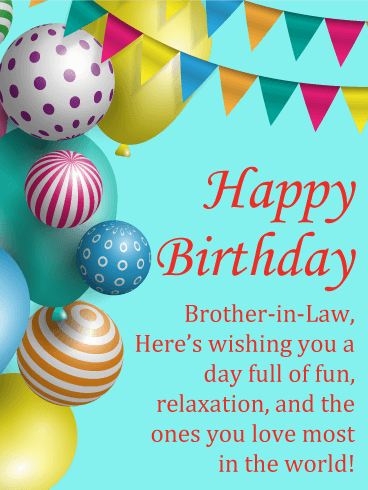 With a pleasant blue background and colorful balloons and streamers, this card is perfect for any brother-in-law. 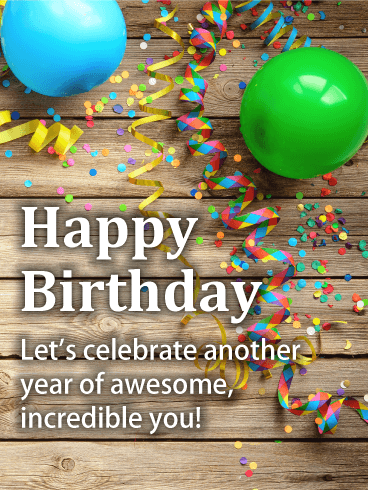 Your thoughtfulness will be appreciated when you send this cheerful happy birthday card! 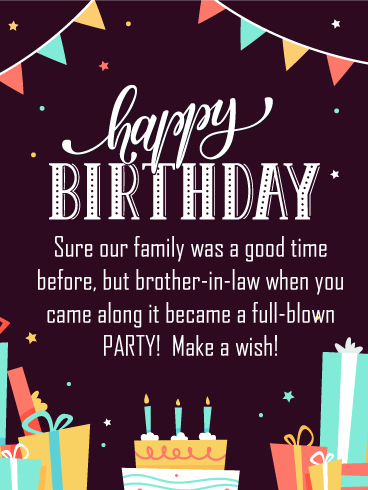 Wish your brother-in-law a fantastic birthday with this extraordinary happy birthday card! 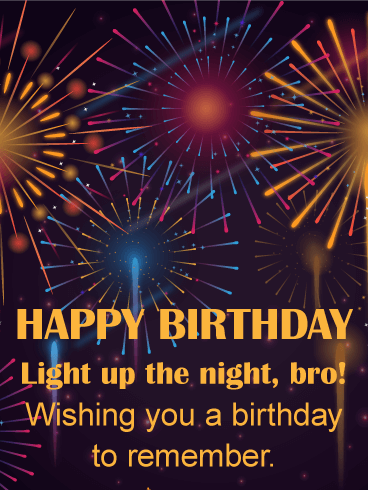 Fireworks light up the night on this great card, with a message that is perfect for a brother-in-law who likes to party! 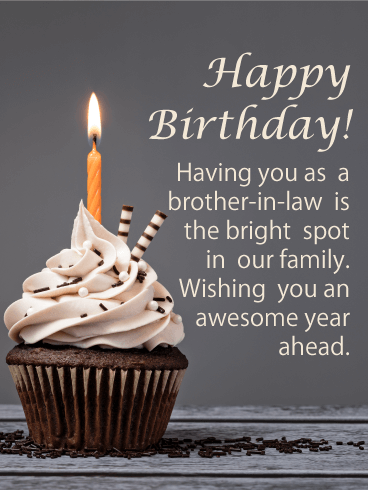 Your brother-in-law will appreciate the thoughtfulness and the message when you send this fun happy birthday brother-in-law card. 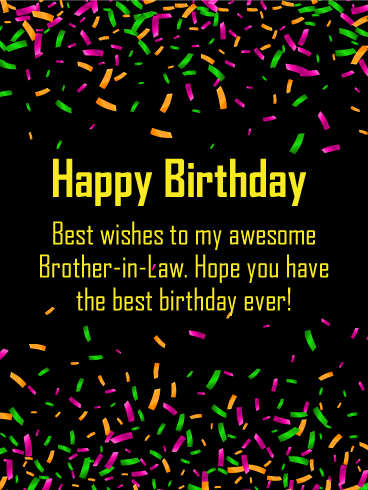 You can't go wrong by choosing this happy birthday card for your young - or young-at-heart - brother-in-law. 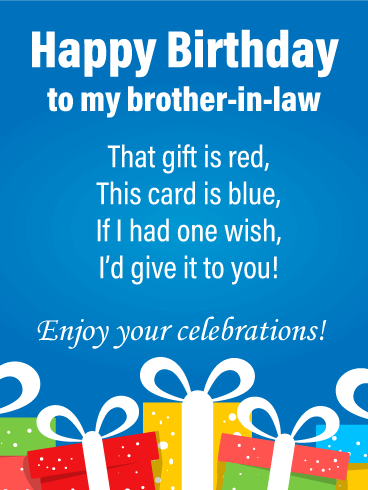 Set a classy tone as you wish your dear brother-in-law a happy birthday with this celebratory birthday card. The royal colors of purple and gold grace this happy birthday card. They symbolize your warm and generous wishes for your brother-in-law on this anniversary of his birth. 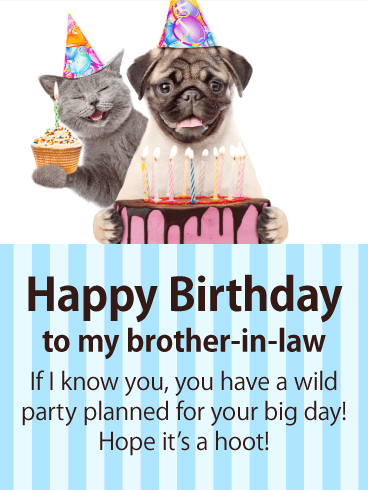 Show your good taste by choosing this attractive happy birthday brother-in-law card for your valued family member. 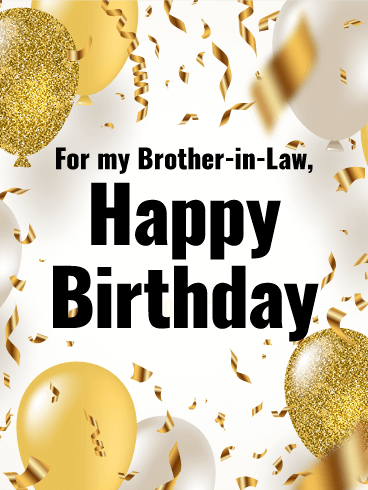 With a black background, colorful confetti, and bright yellow lettering, this happy birthday brother-in-law card really stands out from the crowd! 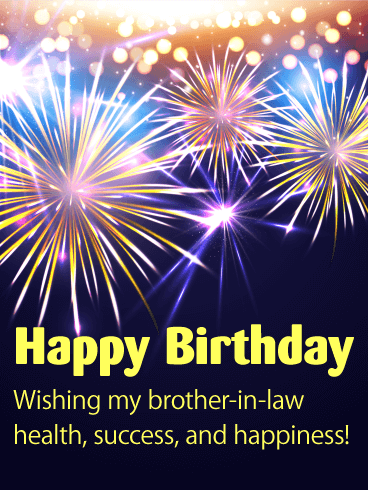 This bright and festive happy birthday card is perfect for any brother-n-law. 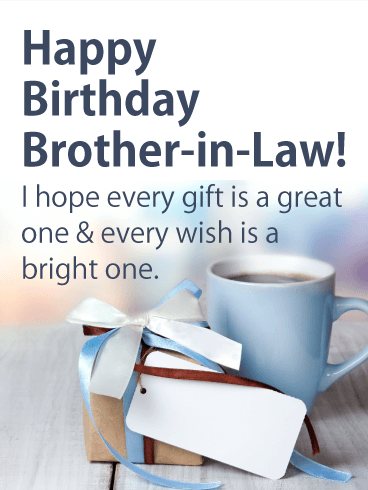 Choose this cheerful birthday card to let your brother-in-law know that you think he's awesome and you're glad he's a part of the family, and wish him a great day. 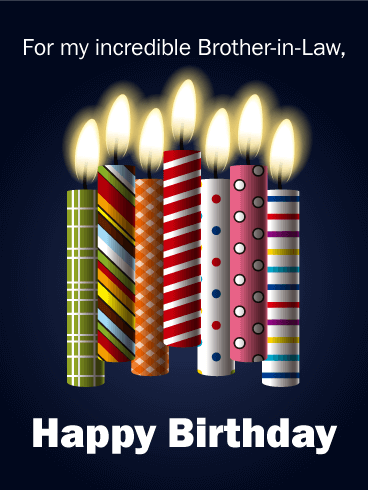 Colorful balloons and streamers float to the top of this attractive happy birthday card. 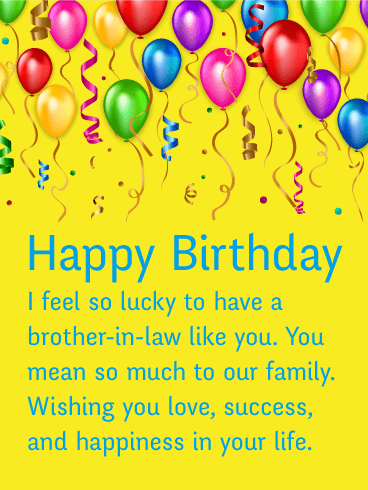 With a bright yellow background and light blue lettering, this birthday card exudes cheerfulness. A genuine, heartfelt message of love, success, and happiness adds to the wonderful effect of this birthday card. Your brother-in-law will be touched by the sentiment and so pleased to receive this card in recognition of his birthday! Fireworks pop and sparkle on the black background of this striking birthday card. 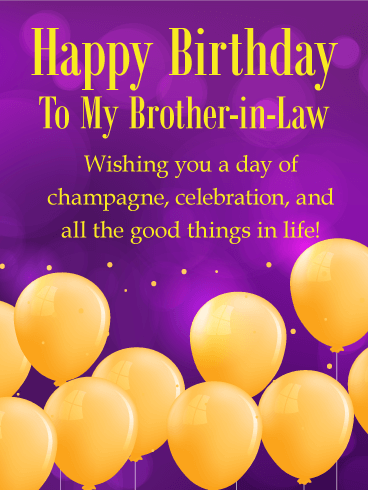 With yellow lettering and a classic message of health, success, and happiness, this is the perfect birthday card to send your brother-in-law. 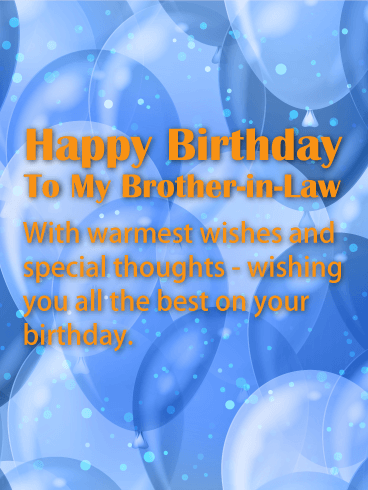 Show your enthusiasm by choosing this beautiful happy birthday card to remember your brother-in-law on his birthday. He is sure to be pleased when he receives these good wishes from you. He's a wonderful addition to your family, and you want to be sure he knows it! 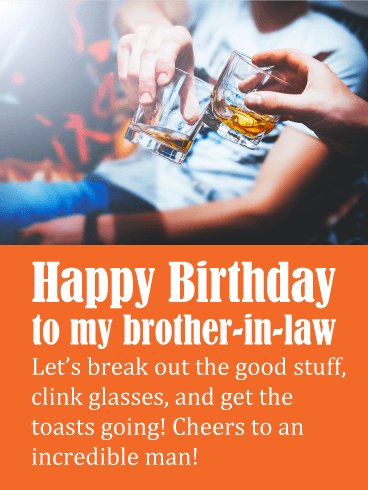 Choose this warm and friendly birthday card with a message of good will as a toast to your brother-in-law on his birthday. 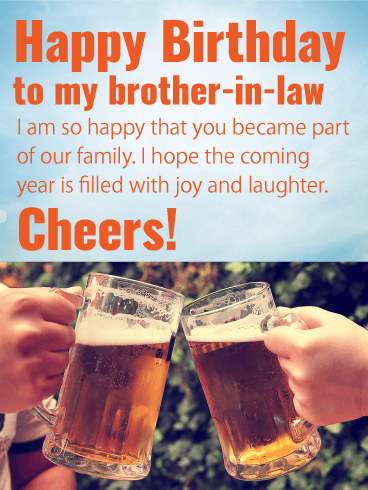 With a photograph of clinking frosty beer mugs, this birthday card's message is one of brotherly love and comradely, to be sure! Your brother-in-law will be so pleased to receive this delightful happy birthday card. This sophisticated happy birthday card sends a stylish message with its white back-ground, black lettering, and white and gold balloons. Gold confetti adds to the image on this lovely birthday card for your brother-in-law. Show your good taste by selecting this classy happy birthday card to remember an important member of your family on his birthday. Your brother-in-law will undoubtedly be pleased with this elegant birthday card.